I’m a bit of a photo-geek, prone to over-analyzing things. One thing I do is to mindfully look at photos, whether they are my photos or someone else’s. This blog post describes how I look at a photo. When I look at a photo, the first thing I do is to just get a gestalt of the whole photo. Is it color, b&w, or some other type of monochrome such as sepia? Is there an obvious point of interest (more on this in a moment)? What is this photo trying to show? I believe that every photo should tell at least a small story. This means that I should know what the story is when I look at the photo. This does not mean that I think that the photo has to tell all aspects of the story. It is fine to leave the viewer imagining what happens next, to let the complete part of the story in their mind. However, what is the purpose of a photo without something to show? Why waste the viewer’s time? This picture tells part of a story, but leaves the viewer to fill in many of the details. Is she the hunter or the hunted? How did she end up in this place? This photo features the lovely Corissa Scroggie. When looking at a photo, I observe how my eye moves as I look at the photo. Where does it enter the photo? How does it move within the photo? Does something in the photo lead my eye out of the frame? I normally want my photos to lead the viewer’s eye somewhere in the photo, and not lead them out of the photo. After all, if I lead them out of the photo, they might be done looking at it. How to lead the viewer’s eye is the subject of another blog entry. However, here is a photo that uses the chevrons in the lava (arrow-like features) to point at the woman coming through the hole. Look at it and see where your eye ends up. This caver is coming through a small hole from a different room. The patterns in the lava and her red shirt draw the eye to her. 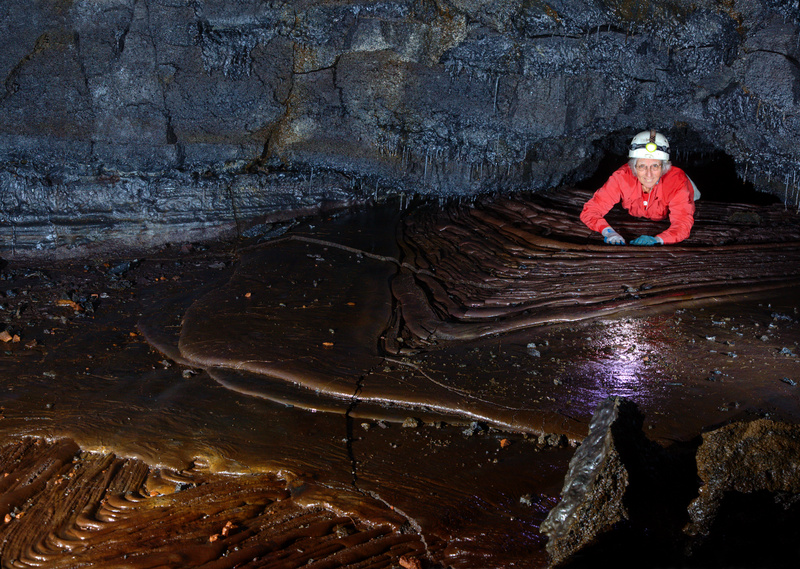 This image features my friend Deb Ward in a cave on the island of Hawai`i. After I have been mindful of my viewing to this point, I might look at the technical details. For example, I look at the focus issues; what is in focus and what is not? This could be identifying the depth-of-field. It could be looking at sharp and soft focus areas. It could be looking at motion blur. All of these can be used for artistic purposes, or they could be technical mistakes. For my photos, if these are mistakes, the photo goes away. There is no reason to show anybody any of my photos with mistakes in them unless I am teaching a class and what to show what can go wrong. Another technical issue I look at is lighting. I identify the light source(s) by looking at shadows and mentally calculating where the light needs to be to produce that shadow. I also look at the character of the light: how hard or soft are each of the sources? Does one light source have a different color from the others? Details of each of these points will also appear in upcoming blog entries. Why be mindful when you look at a photo? For a photo I really like, looking at it can take me several minutes at least. However, being aware of how I look at a photo also means that when I plan a photo to take, I take all of these factors into account. I feel that this means my photos are more interesting. If you are not already looking at photos in a mindful way, try it and see how your photography changes. Much has been written about workflow for photographers. There are even applications that claim to help you organize your workflow. Here is a description of my current workflow and a short description of the tools I use in my workflow. My camera records the images in RAW mode. Even if you do not know how to do raw processing, it is a good idea to record this way. I can go back and do raw processing for photos that I took years ago, before I understood the possibilities of raw, because my camera was recording the data and I saved it. My goal in the photography is to get the photo in the camera as close to the final version as possible. In general, it takes more time to deal with something in post processing than at the beginning. For example, when I take photos of models, I ask the makeup artist to be sure to cover any blemishes. This takes only a few minutes of makeup time. However, when multiplied by all of the photos that we take, the time to fix a zit adds up. For a friend’s wedding I photographed, I got to know every zit on everybody, because I went through removing them in several hundred photos. This was hours of zit removal. It is a good thing that she is a special friend. I would not do this for just anybody unless they were paying me by the hour. When I get to my computer, I copy the photos off of the memory card and onto my computer. I then do a backup. Before anything else happens, I want to know that the pictures exist in at least two places. Later, they will be backed up again and end up in at least four places. My paranoia is justified, because many disk drives have failed on me. However, I rarely lose much, if any, data in a disk failure because of my backup paranoia. Disk space is cheap. 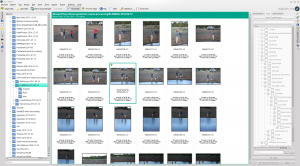 Once I have the photos backed up, I use digiKam and sometimes gwenview to do my first cut. I tend to be pretty brutal in this cut. I delete the photos that are blurry, exposed too badly to recover from the raw, etc. The other photos that do not make the cut go into a folder named “Rest”, and they will be archived. Rarely do I find myself needing to access them again, although they are useful for demonstrating what not to do. Also, sometimes I later decide that a photo is worth some extra work. 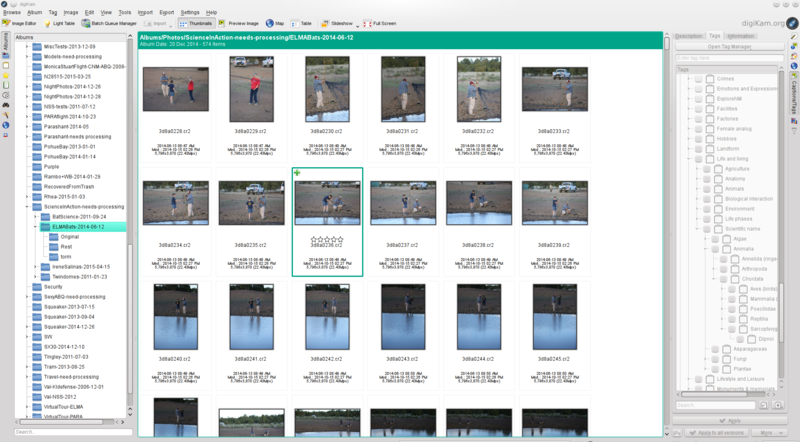 A screen shot of using darktable for raw file processing. In this case, the photos are of Katt W.
Now, I have decided on what photos I like, and therefore what photos will get further attention. I switch tools and open the raw files in darktable, my primary raw conversion tool. I have used UFRaw combined with the GIMP, and also AfterShot Pro II (a commercial product). However, I have yet to find anything that gives me more of what I want for raw processing than darktable. In darktable, I set the proper white balance, adjust brightness, contrast, and similar exposure adjustments. I might rotate the image to straighten it and crop the image if needed. I also do simple sensor dust removal if required (another thing that is much faster to deal with by keeping a clean sensor). In many cases, this is all I do to the photo, and I have spent, at most, five minutes. After all, I was working really hard to ensure that the photo was good in the camera. In this case, I export a JPEG image for general use. Darktable stores its adjustments in a .xmp sidecar file, similar to many other programs. This means that the adjustments are non-destructive and nothing is modifying the original RAW file. For some photos, I use darktable to add a watermark, and I export the watermarked photo at a reduced resolution for use on social media. Since I assume that my photos will be stolen whenever they appear on the web, I use the watermark so I at least get credit for the photo. A person skilled in photo editing can remove the watermark. However, if they are willing to go to that work for a screen-resolution image, they need to get a life. In non-commercial situations, I normally give permission for use when asked, so they are spending more time on the image theft than they would if they were honorable. If additional editing is needed, it is time to switch to the GIMP. In this case, I will export a TIFF image from darktable, and that is what I open for editing. The GIMP supports layers and all the types of editing you can do in Photoshop. This is where I remove zits, soften wrinkles, and do editing such as removing objects from a photo. I save the file in the GIMP’s native format (.xcf), as well as exporting a JPEG for general use. Now that I am happy with the processed images, I go back to digiKam. All of my photos get a title and caption. I also add keywords (tags), and add my copyright information into the file’s metadata. Again, this helps to know where my photos are used when they are stolen. It also helps honest people contact me to ask for permission, since my contact info appears in the metadata of every photo. At this point, I am done. If the photos are for a customer, I upload them to a password-protected page on my web site and send the customer a message with instructions on how to get the photos. I also do another backup or two. You might have noticed that everything that I list above is open-source software. This means that (a) it is free (as in both beer and speech), and (b) probably better-supported than most commercial software. Given that my image-processing computer is running OpenSUSE, a flavor of the GNU/Linux system, these are nearly the only choices. The good news is that digiKam beats any other software for its tagging—I have tried them all, and there is absolutely nothing that is better. Few even come close. Darktable and the GIMP are easily the equal of their commercial competition. In fact, university research into new image processing algorithms occurs in open source programs and then ends up in commercial products such as Photoshop. Admittedly, Adobe has their own research team. However, any good ideas rapidly propagate into the open-source alternatives.